The Algarve is a one-of-a-kind tourist destination, and one of the most beautiful places in the world. Not only does it have a glimmering coastal strip that covers more than 95 miles, but it also combines everything from relaxing golf and ocean sports, with night clubs, beach vacations, and more. Combining a stunning natural environment with a heritage of picturesque coastal towns, the Algarve consists of a number of fisherman villages and natural areas. If you’re looking for beauty that you can’t find anywhere on earth, you’re sure to find plenty of camera-ready shots at the Algarve. For most, the location is considered to be a beach holiday-lover’s dream, with plenty of opportunities to take part in nautical sports including sailing and windsurfing. Of course, there are many other hidden gems in the Algarve too, depending on where you care to explore. The region is well-known for its many golf courses, as well as its country walking and hiking routes. For your vacation, you can choose between stunning sightseeing towns like Lagos or Tavira or spending the days in the sun at sandy beaches near Albufeira. There’s also the option to see some fantastic wildlife at the Natural Park in Ria Formosa, where you’ll see the flamingos flock around tourist boats. Considered by many to be the ultimate experience for rest and relaxation, the Algarve is known for its slow-moving cities and peaceful nature. Whether you’re looking to indulge in some delicious gastronomy for amazing prices, or you just want to enjoy the natural heat of the summer sun, you can’t go wrong with a trip to the Algarve – the only question is where exactly you want your vacation to take place. The Algarve is home to many of the loveliest and safest beach environments in the country, and it benefits from a welcoming climate all year around, making it a popular destination for Portugal’s holidaymakers. However, there are some parts of the Algarve that are more developed for tourists than others. For instance, you’ll find that there are a lot of hotels and bars available throughout the Faro West to Albufeira region. Both the facilities and beaches here are amazing, but you may see less of the natural Algarve if you’re looking for history and culture. Elsewhere, towards Tavira and Sagres, you’ll get more of an insight into the organic experiences that the Algarve has to offer, complete with low-key developments and relaxing laid-back resorts. 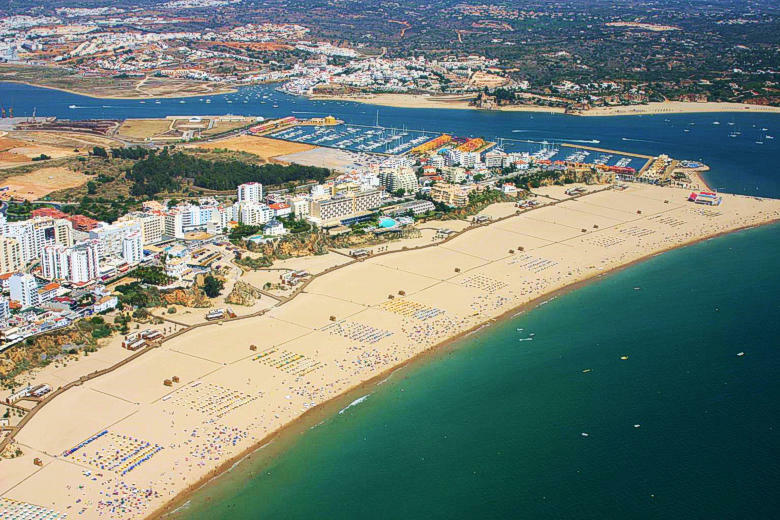 The towns to the west of Vilamoura are ideal for those with an adventurous side. Here’s where you’ll find cove beaches and rocky cliffsides, particularly around the main resorts of Lagos and Armacao de Pera. The coast will become even wilder as you head further west, where you can track down stunning former fishing villages like Salema and Burgau or explore the history of Sagres. For an experience that’s less cluttered by tourists, try heading over to the Odeceixe side of the western coast. Just keep in mind that the facilities are somewhat limited here, but the ocean is ideal for surfers. If you head to the East of the Algarve’s, between the Spanish border and Faro, you’ll find a very different world. Most of this space is protected by a natural preservation society, which means that you’re bound to see lots of stunning scenery and natural environments. The East is made up of incredible sandy beaches and barrier islands, and you’ll need to take a short boat trip to get to places like Olhao, Cabanas, and Tavira. In the very centre of the Algarve’s, or the “Inland” as we call it, you may notice that much of the space is still largely undeveloped, particularly around the Spanish border. The great news is that you’ll be able to check out some truly historic sights, like the market town in Loule, or the roman ruins of Milreu. There’s also the old town of Silves available to access through Portimao. It’s worth noting that the Algarve is currently in a period of unprecedented expansion and investment this year, with new businesses opening up, hotels expanding to new seasons, and a new sense of confidence about the possibilities of the region. With that in mind, you can expect to see a lot of new hotels, restaurants and experiences opening up around the Algarve this year, particularly as thousands of new tourists’ flock to Portugal. Some experts around the region believe that 2019 will be a sell-out year for the Algarve, which means that if you want to book a great hotel during the busy seasons of Summer and Spring, then you’ll need to start looking for bargains as early as possible. If you’re wondering when to book your holiday to get the best possible weather, then the first thing you need to know is that the Algarve has very long, and very hot summers. If you’re looking for something milder, you may prefer heading over in the Spring or Autumn months instead. Even the winters are relatively mild in the Algarve’s, but they can experience some unpredictable wet days too. The tourist season usually thrives most during the months of July to August. You’ll find the beaches packed full of people at this time, and the hotels will sell out very quickly. June and September are also popular months – though usually with couples, as they’re outside of the school holidays. If you’re hoping to avoid the hordes of kids, but you still want great weather, then this is a great time to go. 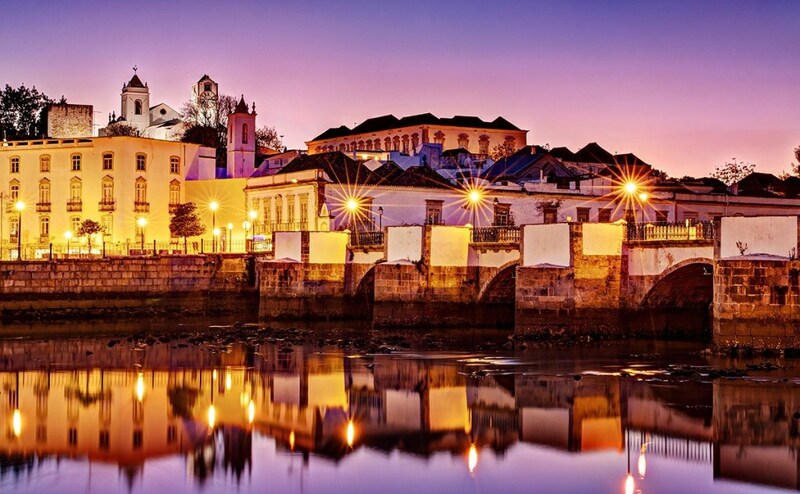 Tavira is a stunning town found on the banks of the Gilao river. Much of the town itself has remained unchanged throughout the years, which means that it’s packed full of heritage, charm and history. If you’re looking for cobbled streets and traditional houses – this is the place for you. You can even spend some time exploring an ancient castle. The beach is available to reach via ferry, and you can also check out the salt water lagoons of the natural part of Ria Formosa along the way. It’s a great laid-back destination perfect for couples and single explorers. However, this definitely isn’t the place for party-goers or families, as it’s more about peace and quiet, than drinking the night away or screaming children. Probably one of the best-known resorts in the Algarve, Albufeira excels at giving you everything you need from a vacation location. The beach is huge, and there are plenty of holiday activities to enjoy. 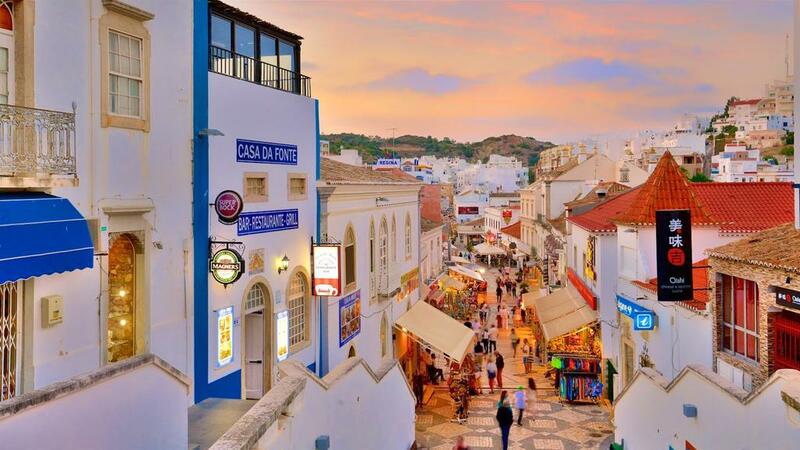 You’ll also find countless delicious restaurants and stores in the old town section of Albufeira. For people who love to party, there’s the “Strip”, a road packed with amazing clubs and bars. The strip is just far enough away from the rest of the action that it’s not going to annoy any other visitors too. It’s great for tourists from virtually any background, but if you don’t like the idea of crowds during summer, then you might not want to choose Albufeira for your holiday. This destination can get seriously busy. Check out the official Albufeira tourism page here. 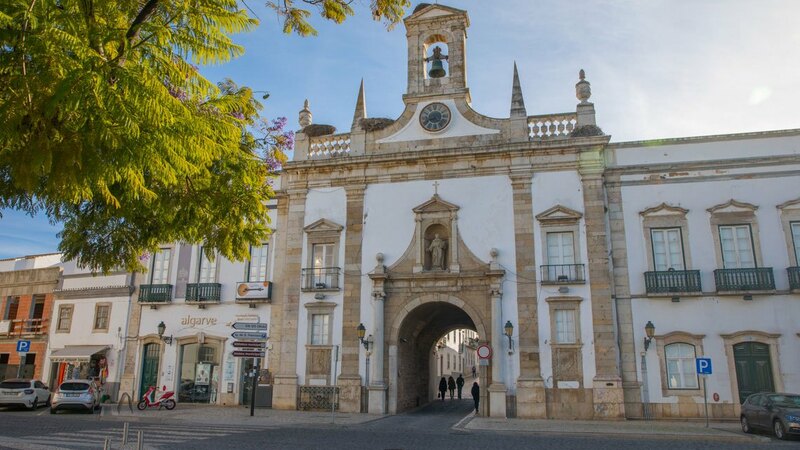 If you want your trip to the Algarve to be brimming with beautiful scenery and history, then try a trip to Lagos, on the western side of the Algarve. You’ll find plenty of amazing towns and interesting locations to explore, among sandstone cliffs and beautiful beaches. You’ll also be close to the Dona Ana beach, which many feel is the most incredible in the Algarve, with its soft white sandy coastline. Further along the coast, you’ll see the stunning cliffs along Ponta de Piedade, and you may be able to book a day trip to small fishing villages like Sagres too. This location is great if you want to experience some history in your trip – not just sun and sand. It’s not ideal for party animals, as there’s very little nightlife. 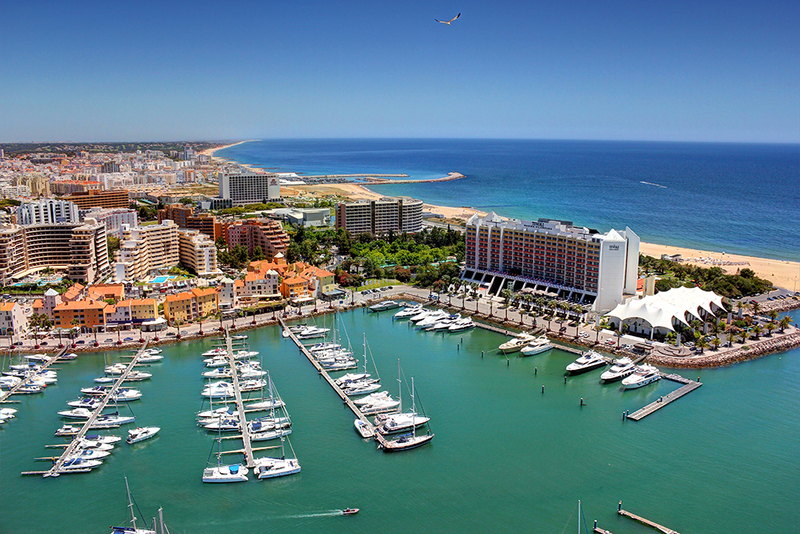 You need to have plenty of cash to splash if you’re going to take a trip to Vilamoura. This is the most exclusive town in the Algarve, as the holiday destination of the rich and famous. The whole location revolves around the marina which is filled with seriously expensive yachts and boats. There’s no less than 6 championship-level golf courses to choose from, and there are plenty of trendy stores to visit. This is an ideal location for upmarket golf holidays, but it’s not the place to go if you’re searching for a bargain vacation. Check out the official marina page here. Probably one of the most overlooked parts of the Algarve, Faro is primarily used as a hub for transportation, but it also has a lot more to offer if you’re willing to explore. There’s a beautiful historical centre that’s brimming with great places to spend your money if you’re looking for some mementos. Additionally, you can head to the marina and sign up for boat tours to the Ria Formosa National Park too. The main beach of Praia de Faro is very relaxing, even though it’s only about five minutes from the airport. This is a great short-stay destination if you want to visit multiple locations during your time on holiday. If you want all the magic of Albufeira, but you don’t want the crowds, then you could try the alternative destination – Praia da Rocha. This location comes with a massive beach – even bigger than Albufeira’s, where you can find small coves hidden beyond sandstone cliffs. There are plenty of restaurants and bars to explore, although the appearance is much more modern than what you’ll get in Albufeira. 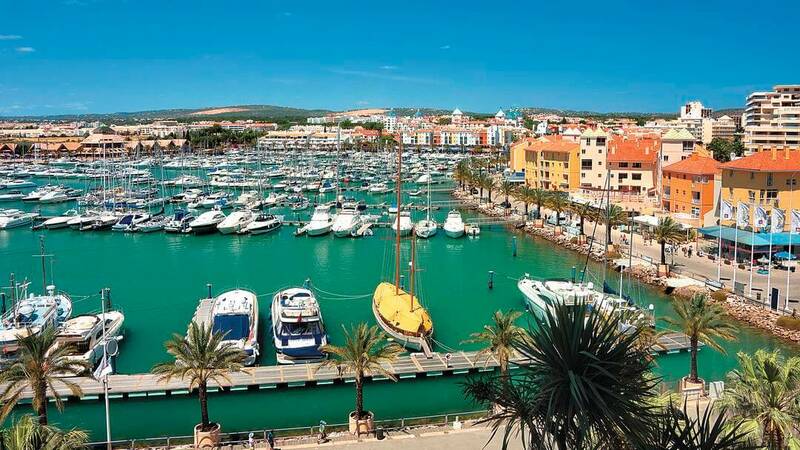 For those who need a break from all the chaos, there’s also a large town nearby in the form of Portimao, where you’ll find plenty of things to do with the family. It’s a great destination for couples and families, but not as ideal for anyone who wants to see the history of the Algarve. Check out the official Praia Da Rocha tourism site here. Many people consider the Algarve region of Portugal to be the most “international” part of the country, which means that you shouldn’t have too much trouble finding someone who speaks English, German, French, and other languages too. Additionally, it’s worth noting that Portugal is in the same GMT time zone that we’re used to at home. Another thing worth noting is that most of the Algarve region is very safe to travel in, there’s not a lot of crime throughout Portugal in general, although you might see some police on the streets. Most of the time, the police come out around the summer to make sure that people don’t get too over-excited, but you shouldn’t worry too much about things like petty theft. Just be sure that you don’t leave your valuables exposed for any reason. For the most part, the services, supermarkets and shops in the region will operate between 9am and 7pm on Mondays to Fridays, and you’ll be able to get most of the things you need between 7am and 1pm on a Saturday. The larger shopping centres such as MAR at Loule open all day, every day. In terms of what you should be seeing and doing while you’re in the Algarve, the world is your Oyster. The location is one of the most popular destinations not just for people around the world, but for the Portuguese too. The main attraction for most people has to be the stunning beaches around the region, which include incredible coves on the western coast and larger beaches to the east. The water stays warm for most of the year, so you shouldn’t have to worry about going for a dip. The west is the place to be if you’re looking for old bridges, churches and castles, but you can find plenty of natural beauty to the Eastern side of the Algarve too. You’ll also be able to track down plenty of places to engage in some water sports or play a round of golf when you’re visiting. There’s also locations for the children to visit, such as Aqualand, Zoomarine, and Slide and Splash. The Ria Formosa is known as one of the 7 natural wonders in Portugal, and within this protected area, you’ll be able to soak up plenty of nature on a guided tour. Just remember that there are so many scenic spots to explore, that you might need to plan your days if you want to fit everything. We’d recommend making sure that you have a small car to get around in and a GPS to keep you on the right track as you explore the roads. 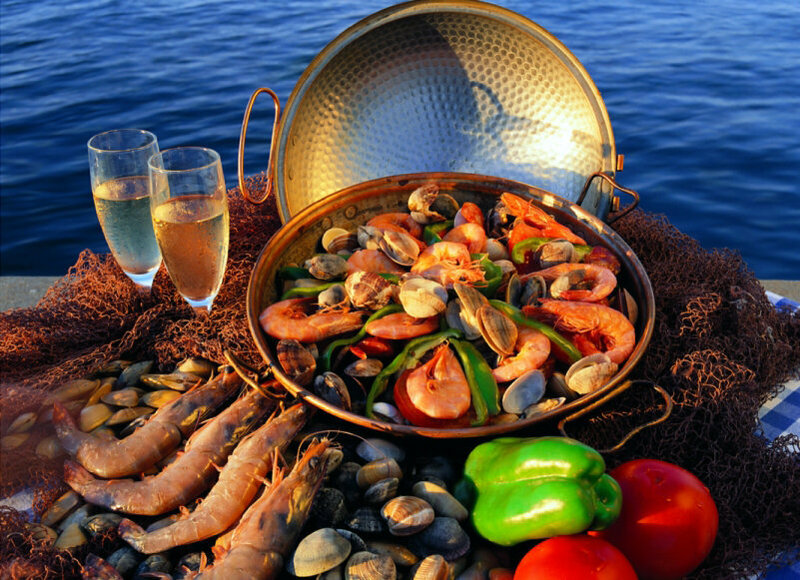 What Kind of Food is in the Algarve? The more you visit the Algarve, the more likely it is that you’ll find a favourite restaurant or pub that you simply fall in love with. Keep in mind that the destination is made up mostly of fishing villages, so you can expect to get a lot of fresh seafood in the restaurants around the local towns. Most of the time, the base of the main meals you’ll get here will include fish, vegetables, and meat. The codfish is the ultimate natural dish. Portugal consumes codfish with boiled potatoes and chickpeas during Christmas – instead of turkey. To really get the best out of your food experience in the Algarve, make sure that you find a restaurant that can deliver a mixture of recipes from both interior and coastal regions. Every morning, the harbours are packed full of boats delivering the fresh fish into the markets, which are then prepared at fine restaurants. Some of the most popular dishes for locals are the soups, as well as fish stews and shellfish plates. You can always get other meats besides fish, too, such as cherry chicken and beef stew. When you’re done with your main meals, it’s worth seeing what the Algarve has to offer for dessert – as the location is well-known for its sweet treats. You’ll probably find yourself wanting to try a bite of everything, from figs filled with almonds, to Dom Rodrigos and more. Most of the sweets come with honey and almonds packed to the brim. As mentioned above, the most popular locations to visit in the Algarve by far are its stunning beaches. In fact, the location is known for having some of the most beautiful beaches in the world. Along almost 200 kilometres of coastline, you’ll find everything from sheltered coastal locations where you can check out ancient caves, to white sandy beaches where you can easily soak up the sun. As you may have noticed by now, one of the reasons why the Algarve is so popular is that it offers a little something for almost everyone. Of course, the diversity of the destination is also why so many people can’t get by with just one visit. Most families, couples, and even individual explorers find themselves returning to these sandy shores time and time again. Finally, if you’re looking for a way to get away from all the stress of life back home, whether it’s an annoying job, or your university studies, then there’s nothing quite like central Algarve for a night of partying. The best and most exciting destination for stag dos, hen dos, and other party animals has to be Albufeira, but where you should go can depend on what you want to do. For instance, there are many more modern bars at Praia da Rocha. We recommend visiting between June and September to avoid the crowds and still get plenty of sun. Visit the coastal towns of the Algarve for the ultimate multi-destination and touring holidays. Each town comes with its own unique appeal, and there isn’t a lot of distance between them, so you can travel from one to the next very easily. 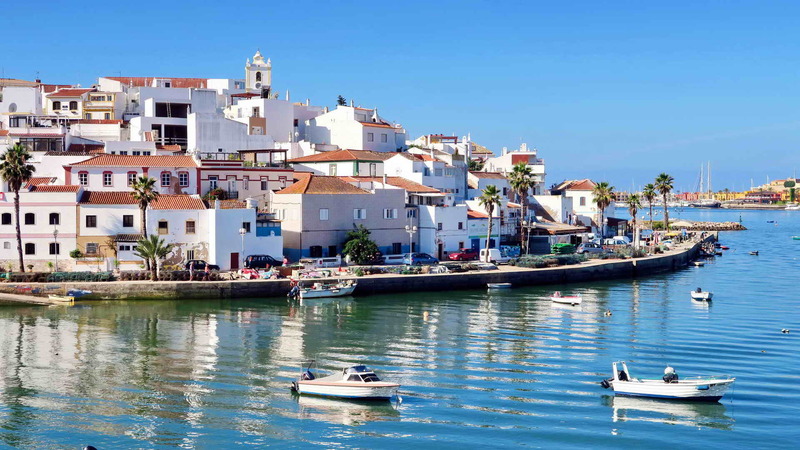 Popular routes generally combine the eastern side of the Algarve with cities like Tavira and Santo Antonio, to the centre of the region, where you’ll find Vilamoura and Albufeira. If you have enough time, check out the Western authenticity of Lagos and Sagres too. The Algarve is a perfect destination for family holidays, whether you’re visiting with teenagers or young kids. For younger families, we recommend trying Carvoeiro, Alvor, and Praia da Luz. Here, you’ll find relaxing beaches and gentle waters. On the other hand, if you’re traveling with teenagers, make sure that you check out the water parks and theme parks of central Algarve. The entrance fees can be expensive, but it’s worth it to see the smile on the kids’ faces. Remember that the central part of the Algarve is brimming with English speakers, so you won’t have too much trouble asking questions in stores or cafes. The chances are that your kids will want to keep coming back to the same destinations for years to come.